I confess, before I listened to The Insecurities I didn't realize that lead singer, songwriter and guitarist Stubhy Pandav was also the frontman in local mainstays Lucky Boys Confusion. It wasn't until after I played the band's debut EP, "Ban the Kiss Hello: A Social Commentary," that I found out about the connection, and it's just as well because to my ears the two bands have little else in common. While LBC have long been known for their rowdy pop punk "party rock," The Insecurities take a more thoughtful approach, and are even better for it. "Ban the Kiss Hello" boasts lyrics that are more meaningful, performances that seem more heartfelt and sounds that are more diverse. All of this adds up to a tuneful, well-crafted mini record that you don't have to be in a party mood to play. That said, Pandav hasn't completely abandoned the fun. While the lyrics are far more serious, for the most part the music is upbeat, highly melodic and downright hummable. In fact, each of the five proper songs on the EP (the sixth track is mostly a spoken-word "epilogue" reciting a laundry list of insecure traits) is memorable and has a unique identity. "Circle Three Times" kicks things off with a burst of infectious power pop paired with somber lyrics. If you just paid attention to the music, you'd never guess that Pandav were singing lines such as, "Look at me, yeah, I'm no iron man/I cut my teeth on my father's backhand/I held my breath and jumped into the quicksand." "Waterfalls & Alcohol" is a bit more subdued musically, while the peppy "Me & Mona Lisa" is the closest thing to happiness on the EP. "Cavalier" brings in an unexpected twist by flirting with rockabilly. The sadly beautiful "Bite My Tongue" is possibly the strongest cut, with its excellent melody and my favorite line on the disc - "not every man's a car crash." There's not a weak spot on the disc, and every song gets even better with repeat plays. If we can expect this kind of quality from the band in the future, let's hope an LP isn't far behind. 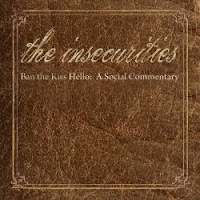 The Insecurities will play a release show for the EP at Elbo Room this Saturday, October 11. Click here for more info and tickets. They are also set to play Beat Kitchen on November 1.